Adult learners connect better with math when it is presented in relatable ways to solve everyday problems found in higher education, work, or life. This math program introduces basic numeracy concepts simple enough for ABE learners then advances through post-secondary college and career readiness levels. Each math concept, from the most basic to algebra and geometry, is related to adult learners’ lives and familiar context. Adults use math to manage finances, to complete home projects, and to make decisions at work and home. Math is discussed in simple, understandable, everyday language, with a focus on comprehension and retention. Number operations and number sense are the foundation of math skills. The GED Academy, TASC Prep Academy, and HiSET academy courses cover basic number knowledge; addition, subtraction, multiplication, and division of whole numbers, fractions, and decimals; problem solving; estimating; rate, interest, money, percentages, ratios, and proportions; and using calculators. These fundamentals give learners a solid foundation for higher-level math and essential skills for daily life. Mastery of number operations and number sense is critical for learners with low-level math skills. This lesson introduces English and metric measurement systems and how to work with and convert units, while also addressing perimeter, volume and time. Measurement is an integral part of adult learners lives at home, at work, and in school, and can be a gap in adult learners’ knowledge that is essential to fill before moving forward. Data analysis, statistics, and probability requires being able to think clearly about numeric information and analyze it in a useful way. These skills will help students make decisions and understand data in their financial and home lives as well as in work and school. The data analysis, statistics, and probability lessons cover graphs; mean, median, and mode; charts and making conclusions from data; and probability and statistics. Geometry and spacial sense is not only a critical math skill but an important math arena for working with objects and representations of space, from reading a map to redecorating a room. Everyday geometry applications are addressed including lessons on perimeter and area, coordinate geometry, lines and angles, plane figures, volume and three-dimensional figures, and Pythagorean theorem. Pre-algebra to quadratic equations are all presented in an easy-to-understand format that teaches students skills to think through math problems logically. 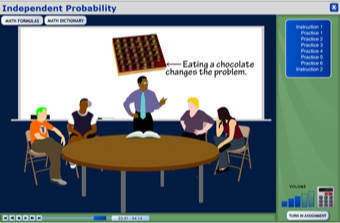 The focus is on easy-to-understand language and the skills to think through a math problem logically. Courses include integers; exponents and scientific notation; variables, expressions, and equations; problems with a missing element; inequalities; linear equations; and quadratic equations. Students do better on the math portion of any high school equivalency test if they have some exposure to what they can expect before they take the test. Students learn time management skills and are introduced to mathematics test answer grids. 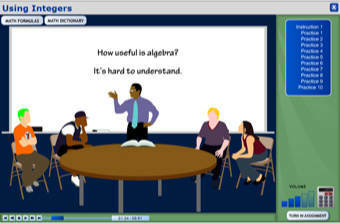 Students also get practice with interactive question types such as text boxes, drop-downs and online calculators.